Over his 12 years in emergency medicine, Dr. Rafi Setrak has witnessed a steady increase in the number of patients seeking care at Niagara Health’s Emergency Departments. "There is no idle time in the Emergency Department," says Dr. Setrak, Niagara Health’s Chief of Emergency Medicine. "I haven't seen idle time in an ED in a decade or more." One thing that has stayed the same over Dr. Setrak’s career is the healthcare team’s commitment to providing patients quality care in a timely manner. During the winter months, Emergency Department and Urgent Care Centres are especially busy. Knowing what to expect during an Emergency Department or Urgent Care visit can help improve a patient’s experience, he says. Emergency Department care focuses first on diagnosing the patient and second on determining whether they can be safely treated within the Emergency Department and discharged home, or whether they need to be admitted to hospital for further treatment. Urgent care is medical attention and treatment for people needing immediate care for illness or injury that is not serious enough for a visit to the Emergency Department. No appointments are necessary, and wait times are typically shorter in Urgent Care Centres than in Emergency Departments. 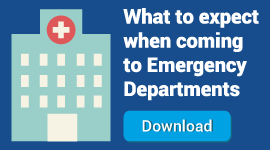 Emergency Departments are significantly busier than Urgent Care Centres, and there are often questions about how Emergency Departments are organized to care for patients. A specially trained Triage Nurse, who is located at the front of the Emergency Department, conducts the initial assessment of the patient. Patients are seen on a priority basis, not on a first-come first-served basis. Canadian hospitals all use the same triage scale when assessing patients to ensure the most urgent cases are seen first. And things can change quickly in an Emergency Department. For instance, if someone is brought in suffering from a heart attack or has been in a serious car accident, they will be seen before other patients who have less urgent conditions and can safely wait. When the patient is brought inside the Emergency Department, a nurse may do another assessment before the patient is seen by a physician or nurse practitioner (a specially trained advanced practice nurse). To diagnose the patient, the physician or nurse practitioner may order bloodwork, X-rays, ultrasound, and other tests, a process that could take several hours to complete. Throughout this period, the patient could expect to see a number of different members of the healthcare team, including lab assistants, medical imaging technologists and respiratory therapists. The Emergency Department physician may also request a consultation with a specialist in cardiology, for example, if the patient is having heart issues, or an orthopedic surgeon for a serious bone break. The Emergency Department physician or nurse practitioner will review the test results with the patient and discuss suggested next steps in care. It is at this point that the patient will either be discharged, with instructions for follow-up care if required, or admitted to an inpatient unit. Activity in other areas of the hospital can also influence wait times in the Emergency Department. This includes the length of time patients admitted to an inpatient unit may have to wait before they are transferred to a bed. Like many other hospitals, Niagara Health cares for a number of patients who may no longer require the resources of the hospital. Many of these patients cannot be safely discharged to another setting without home care or additional services. Some may need different levels of care and wait in hospital beds for space at other healthcare facilities, such as a long-term care home. Improving access to care is a provincial priority, and Niagara Health works closely with the Local Health Integration Network, Ministry of Health and Long-Term Care and other important community partners to find solutions. Our commitment to all of our patients and families is to continue to introduce new initiatives that enhance the experience for everyone. Emergency Departments are busiest in the afternoon and early evening. 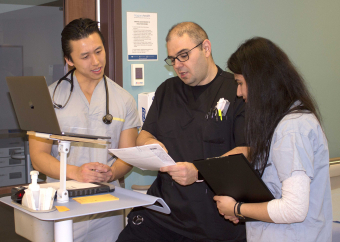 About 32,000 Emergency Department visits in Niagara last year were for minor concerns, like sore throats or prescription renewals that could have been looked after more quickly at a family physician’s office, walk-in clinic or other primary care setting in the community. Taking an ambulance to hospital may not impact the time it takes to see an Emergency Department physician. You will be seen by the physician based on the severity of your health condition. Depending on your condition, you may be placed in a chair in the waiting room to wait. Niagara Health displays real-time wait times for its Emergency Departments and Urgent Care Centres on its website and in waiting rooms to help people make decisions about their care. Niagara Health runs a year-long educational campaign to help the community understand medical options and receive the right level of care as quickly as possible. It is important to bring an up-to-date list of medications -- prescriptions, over-the-counter medications and natural health products when coming to an Emergency Department.